Easily create large, round scoops of ice cream. 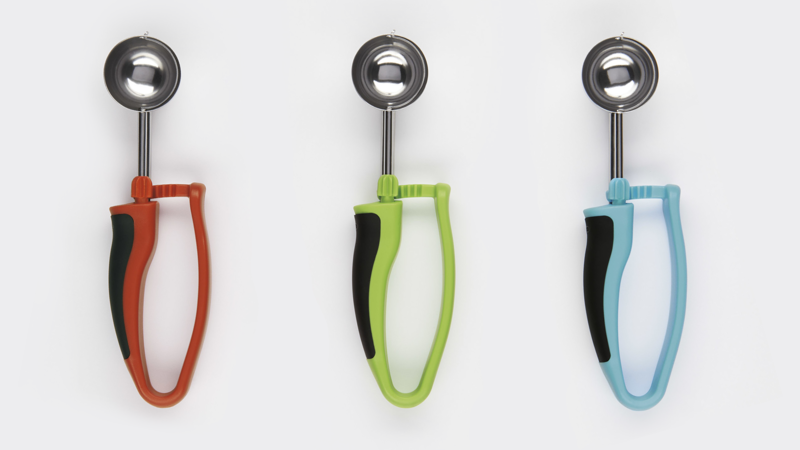 The swiper easily releases hard or soft ice cream with a simple squeeze of the comfortable, contoured handle, without creating thumb fatigue. Most swiper-based ice cream scoops employ a costly mechanism that is difficult to clean. ION developed this integrated design that maximizes comfort in the grip area to promote effortless scooping. Fewer parts are also better for the bottom line. ION also leveraged this design for a medium cookie scoop where comfort is essential for scooping dough for several dozen cookies or more.